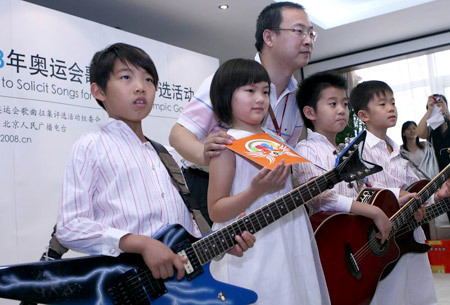 (BEIJING, May 30) -- Four 7-year-old kids from Tianjin, a co-host city of the Beijing 2008 Olympic Games, sang "My 2008" while playing musical instruments in front of an audience at the Beijing Olympic Tower, headquarters of the Games on Thursday. Zhang Tiehan, Jin Shenghao, Li Bochen and Guo Xinyue, three boys and one girl, and all fresh elementary school pupils, became the youngest members of an electrophonic band in China. As they are all going to be eight years in 2008, they decided to add an eight to form the "20088" band, for life-time memory. "I want to run as fast as Liu Xiang, I want to be as skillful as Chinese ping-pong champions…" The lyrics the children sang and their skill in playing guitar, bass guitar as well as shelf drum in a free and confident style were impressive. After submitting the musical work to the office of the campaign to solicit songs for the Beijing Olympics, the children said they were longing to perform at the Olympics opening ceremony to boost the athletes' spirit. "MY 2008" was created in 2006. When posted online, it was well received with up to 10 million page views, said teacher Li Hongyu, adding: "The kids chose today to give a performance not only to express their wish to participate in the Olympics, but also their joy ahead of Children's Day. The Beijing Organizing Committee for the Games of the XXIX Olympiad (BOCOG) launched a five-year project to seek tunes from amateur and professional composers in April 2003. The campaign has received a wide response and the number of submissions in 2007 has surpassed that of the three previous years, according to the campaign office.